Go Wild Joy Clair it's your birthday! 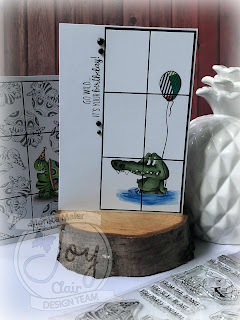 Here is my card... make that 2 cards for the Joy Clair blog today celebrating their birthday! 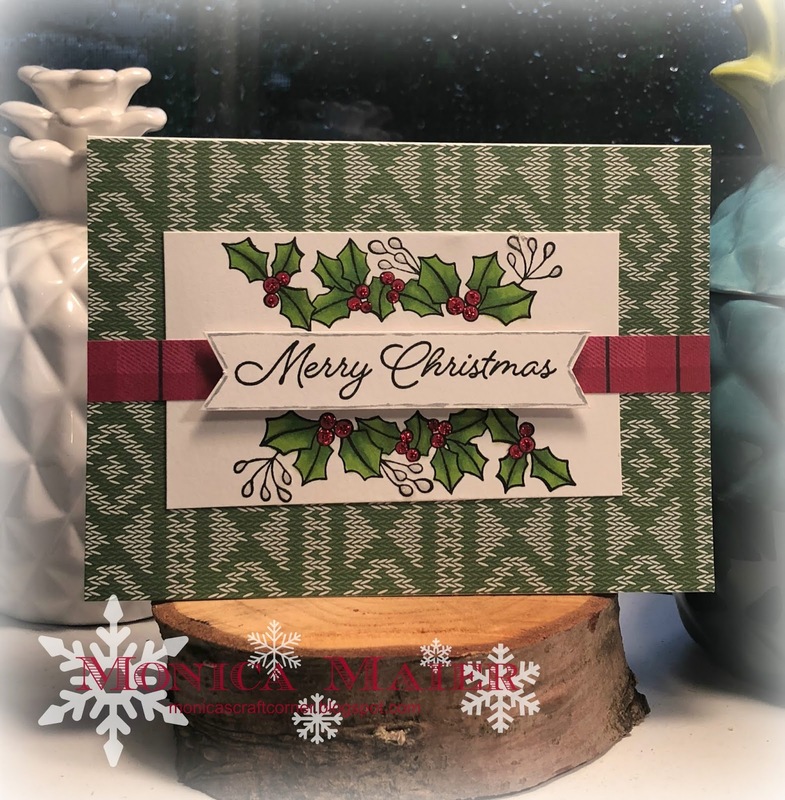 This is a fun technique to do as it create a window look for the card. 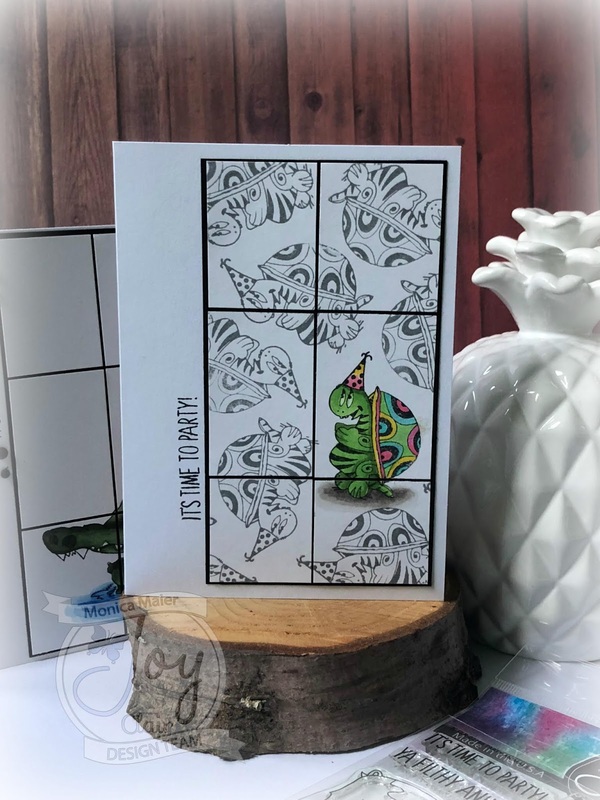 On the first card I used one image from the Party Animals set, colored the image and did a little paper piecing for the balloon. 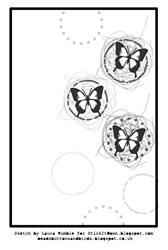 Then cut my panel into 6 and adhered it to a black scrap for a border around the mini panels. For card two I did the same technique, but stamped my image in a gray ink multiple times and the main image in black so I could color it to stand out. 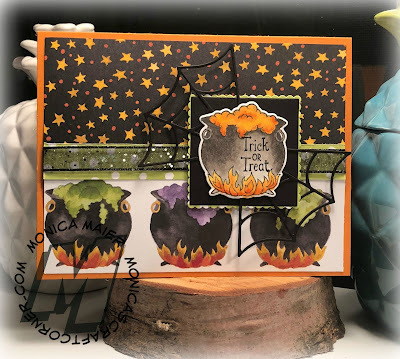 I kept it fairly simple and only colored the cauldron with the sentiment using a mix of copics and Stampin' Blends. I love the paper and wanted to use on the card, I think it's so much fun to create Halloween cards even though I don't send a lot out they are one of my favorites to make! Don't forget to stop by the blog and play with this weeks Make your Mark challenge, I can't wait to see what you share with us. Thanks as always for stopping by! Feel free to leave a comment and follow the blog for updates with new posts! 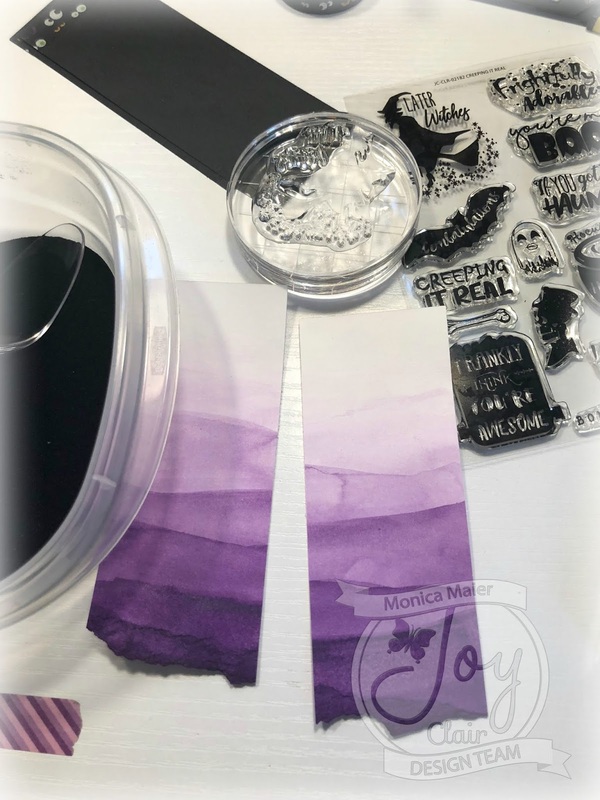 I'm up today on the Joy Clair blog with a card using Heartfelt Sympathy and the bleaching technique. 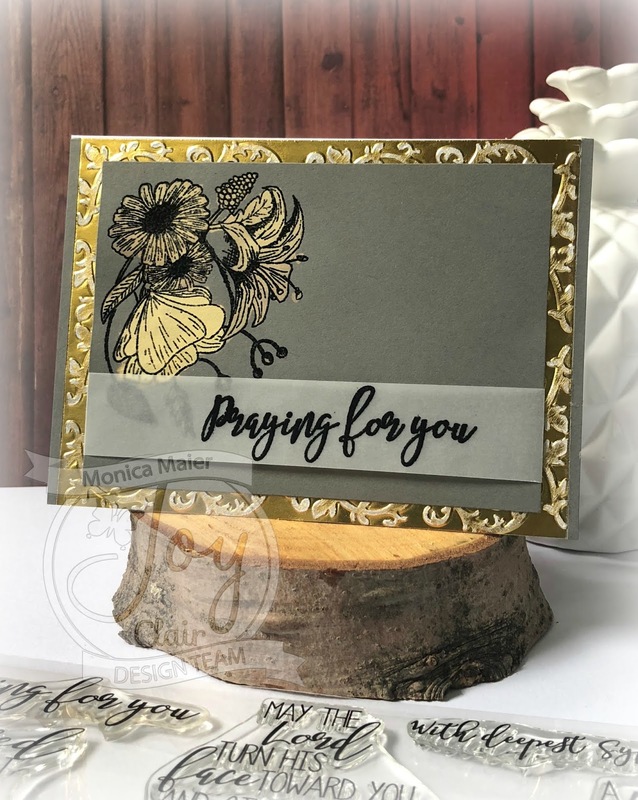 Stop by the blog here to check out the details. Today is a special day for Joy Clair as we are celebrating the stores anniversary! Today is the Anniversary blog hop and we have special guests and prizes to celebrate. As well as a birthday sale over at the Joy Clair store... 30% off starting today until the end of the month! Just use the code BDAY-30 when you check out! For my card I used the set barn party to create a little party with my critters. I wanted to fit as many of the animals as I could and the best way was to stack them! 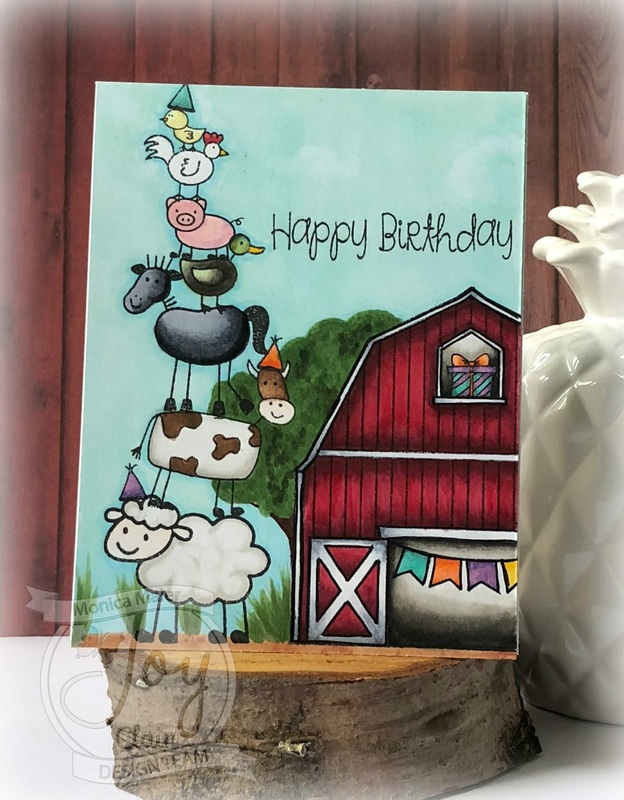 I carefully stamped them on top of each other, then I stamped the barn and added the banner and gift in the openings. It wouldn't be a party with out hats so I gave a few of the critters hats to show the party spirit! 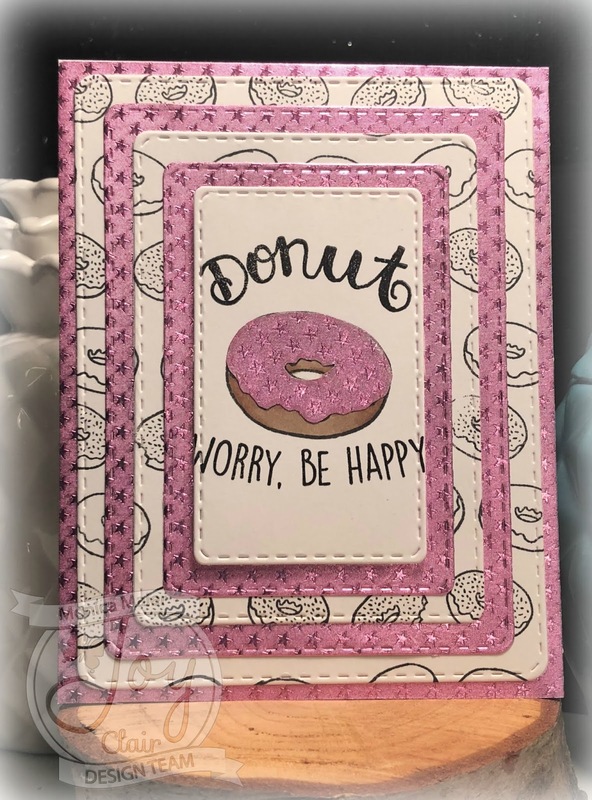 Once all of the images were stamped I colored them in and added some other scenery with copics to complete the card, then adhered the panel to my card. 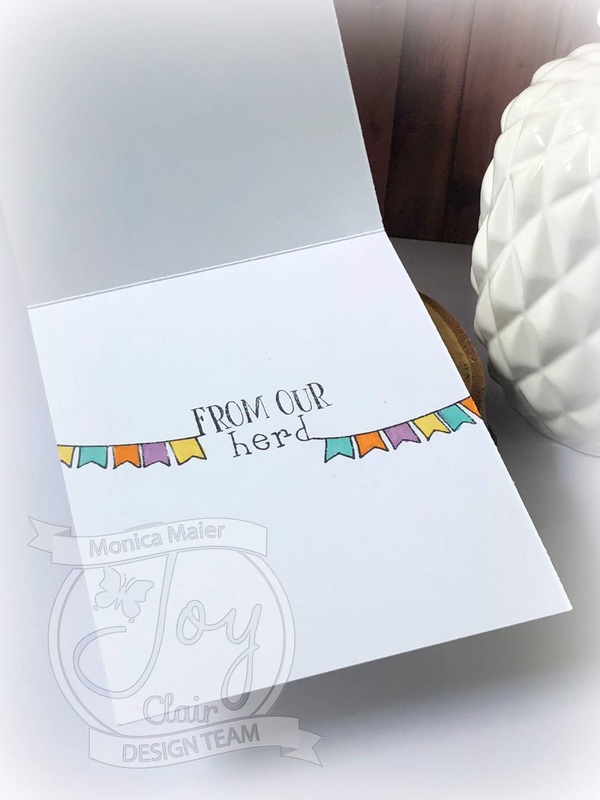 I added another sentiment and some more banners to the inside of the card coloring them to match the banner on the front. Your next stop along the hop is the Jenny Fruchey, but below is the hop list if you missed any along the way. 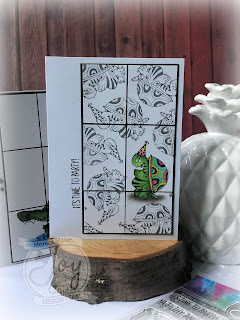 Be sure to check out what everyone created for today's anniversary blog hop, they are all awesome! Thanks for stopping by, please leave a comment or follow me for blog updates! Don't forget to stop by the Joy Clair store and use code BDAY-30 for 30% off your purchase. Have a great day! Today I'm posting my take on the our Sketch over at Stick it Down! This is such a fun sketch, I stayed pretty close to the original idea of the sketch, as it gave a perfect reason to use specific circle set from Catherine Pooler. I haven't used this set much since I've purchased it. Just had to pick some colors and I choose blues and green to keep it more masculine. 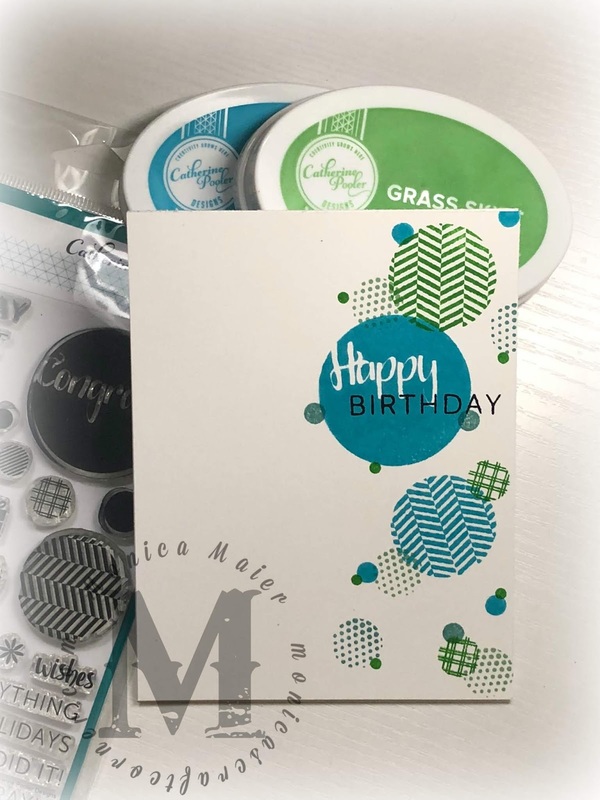 Love all the fun and dimension on this one layer card! It's time for the new release for Joy Clair and there are so many great sets!!! Hope you are as excited about them as we are and have enjoyed the hop! For the release hop I'm using Creeping it Real with a dip dyed technique to make bookmarks. I used watercolor paper with a hand torn edge at the bottom. 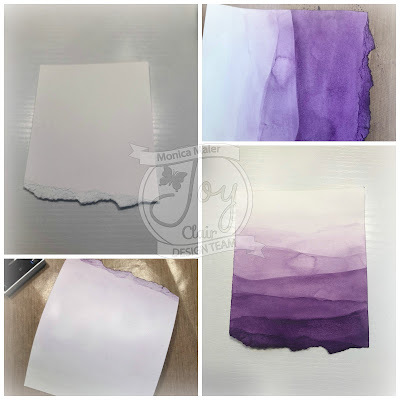 I slowly layered the color on making sure the color was more concentrated at the bottom to create an ombre look... as if the paper were dipped in paint a few times. I then trimmed the paper in half to create two book marks. 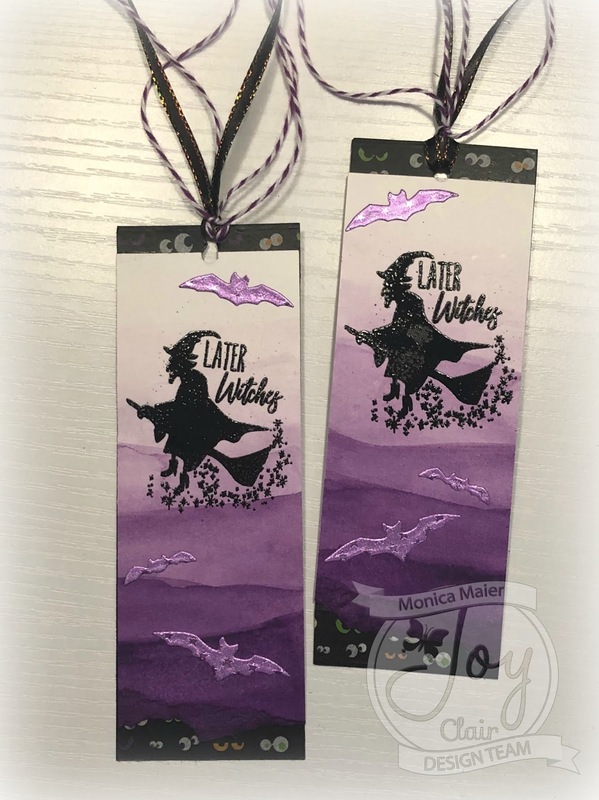 Used the witch image from Creeping it Real and heat embossed it on the bookmarks. 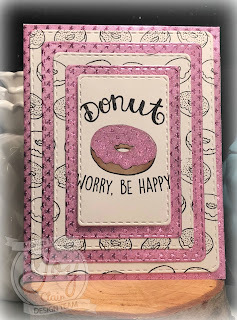 I added the watercolor layer onto black cardstock that had a little bit of washi tape added to the top and bottom. Punched a hole at the top for my ribbon and twine. I decided I needed a little something else on them, so I die cut some bats our of Rinea foil and adhered the to finish the bookmarks. Here is the list for the hop... if you haven't checked them all out you can find them below! Hope you've been commenting for a chance to win a $25 gift card to the Joy Clair store! New Challenge blog Alert and First post! Today I'm sharing my first for the new challenge blog...Merry Little Christmas challenge blog. Its a blog that is always anything goes Christmas!